According to a Chinese saying, no visit to Beijing is complete if you miss climbing the Great Wall or dining on Peking Duck. Eating roast duck in China dates back as far as the Northern and Southern Dynasties (420 – 589). Up until the Southern Song Dynasty (1127 – 1279), ducks were roasted in the area around Jinling, today’s Nanjing. According to the book of The Eastern Capital: A Dream of Splendors Past, written by Meng Yuanlao (1090-1150). The book gives a lively and detailed description of life in the Northern Song capital of Bianliang, based on the author’s reminiscences of his youthful years there. Ducks eggs are consumed more in China than in European cuisine. They are particularly popular are raw material for preserved eggs. The following Yuan Dynasty (1271 – 1368; yes, there is an overlap with the Song, as the Mongol rulers of the Yuan Dynasty conquered China gradually) rulers moved their capital city to Beijing. According to the Standard History of the Yuan, Roasted Duck only spread to Beijing after Bayan of the Baarin the general of the Yuan Dynasty conquered Lin’an, the then capital city of the Southern Song Dynasty. When a Dynasty overthrows another dynasty the capital also changes, the general relocated all the skilled workers from Lin’an, to the new northern capital, Beijing and the skilled duck chef was among them. The ducks were originally roasted in a conventional convection oven until Qing Dynasty (1644 – 1911), when a new type of cooking method and special oven were invented. According to the new method, the ducks were suspended over the flame in an open oven. In that way, the interior and the skin of the ducks were cooked simultaneously, producing that well known end-product with its tender meat and crispy (brushed with a layer of sugar) skin. Preparing a Peking roast duck takes at least four steps: preparing the duck, pumping air beneath the skin, drying and roasting. The restaurant best known for applying this method was Quanjude, founded in 1864 by Yang Quanren. 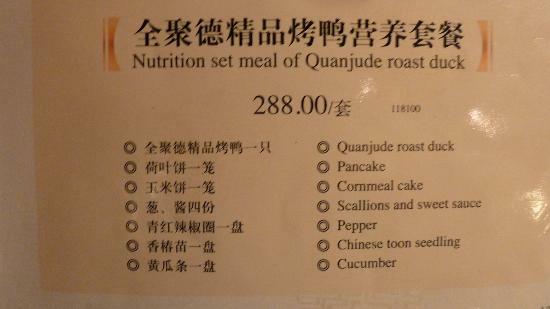 Today, Quanjude has almost become a synonym of Beijing Roast Duck to many Chinese. It is a state owned enterprise listed on the Shenzhen Stock Exchange. Quanjude’s Hepingmen branch not only offers gourmets a chance to dig into the traditional food but also the whole roast-duck culture, thanks to a 1000 square meter museum on the seventh floor. From 1949, Zhou Enlai, the first premier of the People’s Republic of China would often treat foreign guests with Peking Duck. It became part of China’s foreign diplomacy, along with table-tennis. More local cuisinese are known for their duck dishes, in particular that of Nanjing, where people prefer to eat pieces of duck, rather than the whole thing. However, Peking Duck is still the national leader. The Chinese duck raising industry exceeded RMB 100 billion for the first time in 2018. 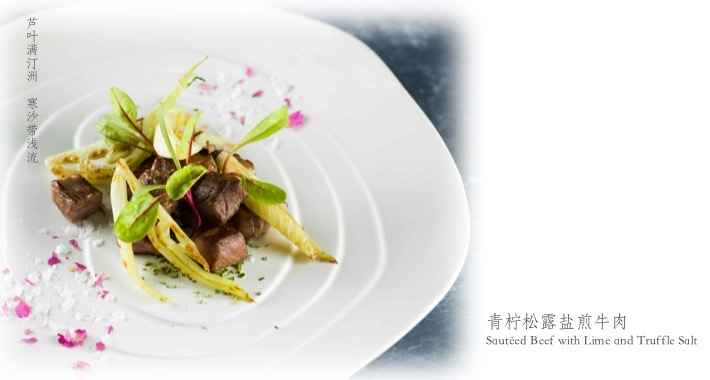 Quanjude had updated its menu earlier in July 2015 to showcase its long-standing culinary heritage. 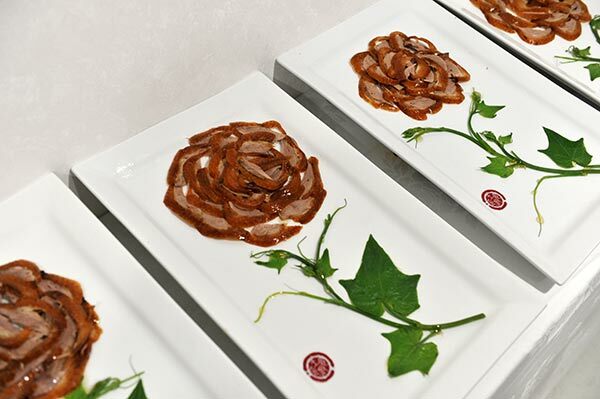 The latest menu features “peony duck”, which is a roast duck presented like a peony flower in full blossom — the delicately sliced breast meat is layered to give the impression of petals, while boiled towel gourd parts make up the green stalk and leaves. The dish was first served at a State banquet during the Asia-Pacific Economic Cooperation summit November 2014 in Beijing, where leaders of more than 20 member economies were present. The Quanjude-made dish has since been served to customers at all branches of the restaurant in Beijing, according to Sun Zhongmin, director for the group’s innovation center. The restaurant has also launched an individual summer special menu of 11 new dishes consisting of both cold and hot items, soups, dumplings and desserts. 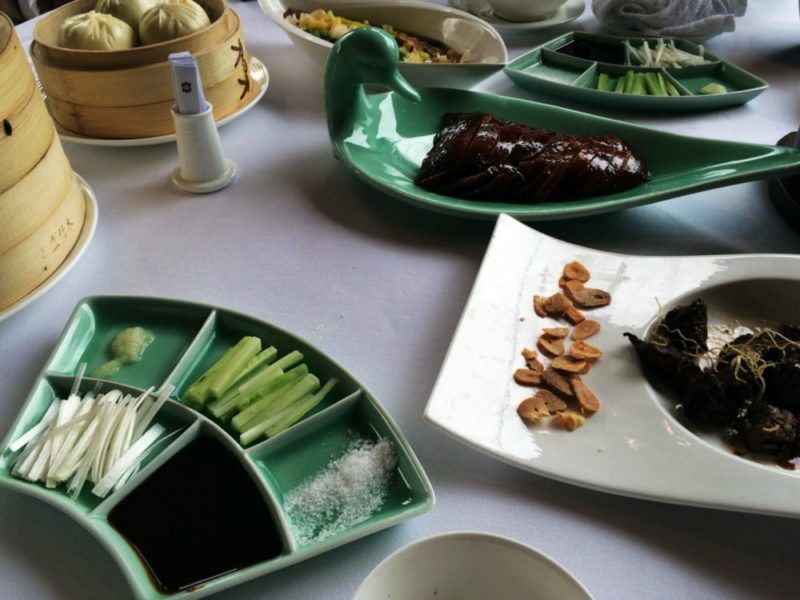 Another restaurant experimenting with modernised version of the traditional Peking Duck is the Shang Palace Restaurant in Beijing. However, the novelty is mainly expressed in the presentation of the various ingredients (pancakes, condiments, etc.) as shown by the picture. A recent innovation was introduced by Sun Lixin of the Bianyifang Duck Restaurant (founded in 1416) in 2003. Sun added a step before roasting – soaking the 3-kg duck in pure juice extracted from onions, carrots, celery, bay leaves, rosemary, tarragon, celery seeds, and aniseed, adding mushroom powder and mirin. A patent was granted for this process (patent nr. : CN1543863). The vegetable juice, being alkaline, eliminates the pungency of the duck but also reduces the duck fat beneath the skin. Peking Duck is eaten with shredded spring onions and cucumber dipped in a sweet fermented sauce (jiang), and wrapped in thing wheat pancakes. The liver, stomach and heart are usually prepared separately and served as side dishes. The meal ends with duck soup made from the carcass and whatever else is still left of the duck. Peking Duck is by no means light food. Even though the new roasting method removes a major part of the fat, the total Peking Duck experience it is still high in protein and carbohydrates. It is so tasty, that you keep eating, and by the time the signal from your stomach telling you that it has more than enough reaches your brain, it is too late. 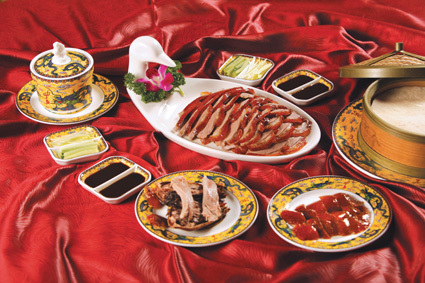 Peking Duck is therefore not a dish that is eaten frequently. It is nice to reserve it for a special occasion like a holiday or a birthday, enjoying it with the entire family or a group of friends. 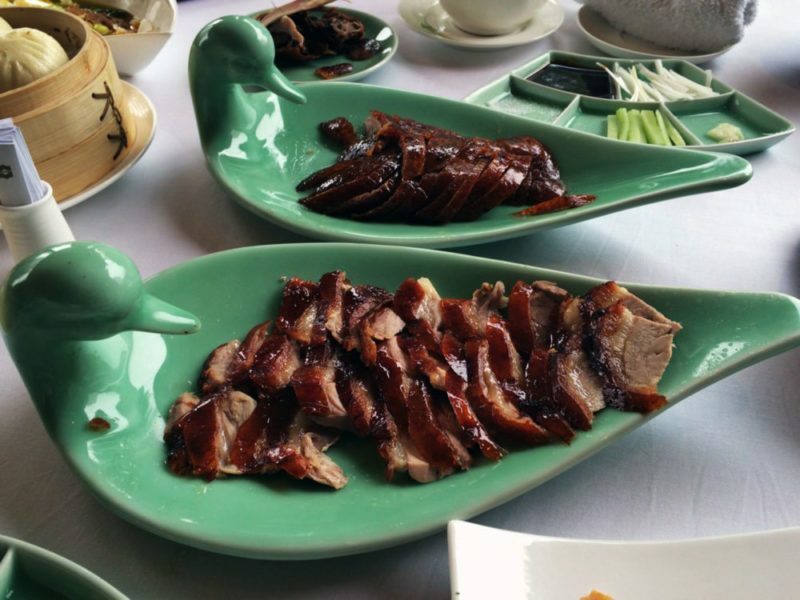 The typical route to innovate Peking Duck and adapt it to the life of the modern urban Chinese is to chop the bird in small one-bite pieces. It so happens that Chinese love to nibble on bones, or chew on tougher bits of meat, much different from the Western preference for tender meat. A number of companies have therefore developed duck wings, duck tongues, duck necks, duck hearts or duck gizzards as one-bite snacks. They are usually individually wrapped, with around 20 snacks in a larger pack. These products are much easier to take pack in your hand luggage on a trip, or eat while watching TV or reading a book. Sharing a few duck wings is also less of a burden to the body than eating an entire duck. 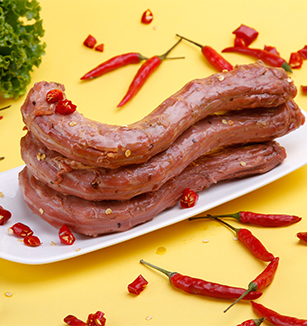 One manufacturer of duck products has gained national fame with its duck necks that are not only sold as packed foods in supermarkets, but also fresh and hot from its 5000 special outlets.The company was established in 2006 as Jueweixuan Business Management Corporation in Changsha (Hunan). A consortium including Kunwu Jiuding Capital Co., Ltd. and Fosun Group has invested RMB 260 million in Juewei in 2011. Juewei generated a turnover of RMB 4.386 billion in 2018; up 13.46%. The company’s brand name Juewei literally means ‘ultimate taste’. This may strike us as rather presumptuous, but the popularity of the products (as well as the large number of copy cats) seems to indicate that the company has lived up to the promise contained in its name. Juewei Duck Necks are as well known in China as KFC’s hot wings. It is an interesting fight between the Chinese duck and the American chicken, and in view of the recent quality problems that have affected KFC in China, the duck seems to be on the winning hand. However, the battle is still going one. By the way; the standard recipe for duck necks includes . . . chicken bones, great and cheap flavour enhancers. Zhouheiya (Hubei) is another Chinese fast food chain known for their signature spicy duck necks. It gained its name from its founder, self made billionaire Zhou Fuyu. Zhouheiya has 400 stores in communities, airports, train stations and other major locations across China. An alliance between a food chain famous for duck necks and a robot might not seem like the most likely combination. But Zhouheiya made it possible by advertising in the film Transformers 4, benefiting immensely from the cooperation. Zhouheiya has ambitious plans to enlarge its production in America and Europe. Zhouheiya got listed on the Hong Kong Stock Exchange in 2016. Credit Suisse Group AG and Morgan Stanley are sponsors, or banks responsible for the IPO. Zhouheiya generated a turnover of RMB 3.249 bln in 2017; up 15.4%. The company has mainly lifted by surging online sales and increased number of retail stores across the country. The group has established a strong presence in 11 major domestic online market places, including one newly operated storefront on Jumei.com, in the first half of 2017. “By leveraging its own social media channels, the company enhanced customer loyalty by active interaction with the customers.” The company has been reshaping its brand into a trendy snack in an attempt to lure young customers, especially millennials, into buying what used to be seen as an old fashioned snack food. Zhouheiya made headlines in 2014 when its logo briefly appeared on screen in the Hollywood blockbuster Transformers: Age of Extinction, creating valuable media buzz for the brand. Another competitor from Hubei is Jingwu (Kingwuu). Jingwu has derived its name from the well-known Jingwu Road in Wuhan. The company is a supplier of cooked and marinated duck and goose meat products. 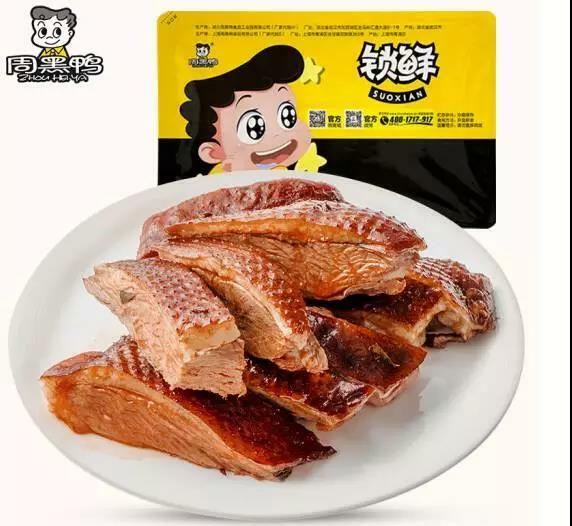 Jingwu aims to develop a series of products with special characteristics including preserved Jingwu duck necks, and duck feet with a unique taste. One of the earlier players in the lucrative duck neck market is Huangshanghuang from Jiangxi province. 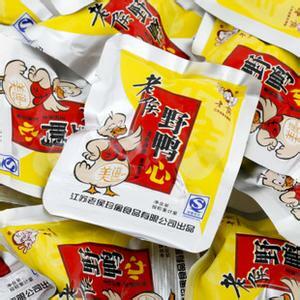 This company was founded in 1993 as a collective enterprise in Nanchang, the capital of Jiangxi and gradually developed into the Huangshanghuang Food Group. It was listed on the Shenzhen Stock Exchange in 2012. Although it is a predecessor of Zhouheiya and Juewei, Huangshanghuang’s turnover of 2017 was RMB 1.478 bln, so considerably less than the two leaders. However, as Huangshanghuang has a much broader product range, we should be careful in comparing it with the two duck specialists. Duck necks have become such a fad these days, that a duck neck eating competition was organised in Wuhan in July 2015. According to the rules, participants were asked to finish a 350 gr box of duck necks and leave no more than 150 gr of bones in as short a time as possible. However, the success of the two Wuhan-based companies Juewei and Zhouheiya is so huge, that one competitor, Shanghai-based Jiujiuya, has adopted a strategy to attack them in their own home region. 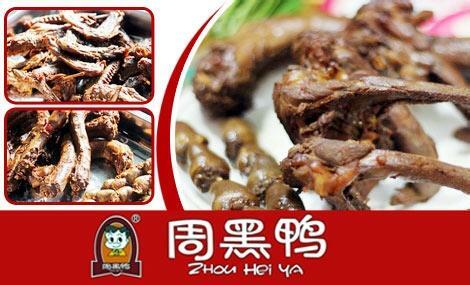 Jiujiuya is advertising its products as ‘Wuhan-style duck necks’, ‘Wuhan-style duck wings’, etc. The company also appointed a former CEO of a major mineral water brand from Guangzhou as its regional manager for Central China, indicating that it is focusing its marketing efforts on the heartland of duck necks. The following picture shows a typical Jiujiuya outlet. Zhouheiya entered 2018 with a new strategy to battle its main competitor: the company added a range of goose products to its portofolio. So far, there has been no reaction to this move from Juewei. The Chinese affection for nibbling on duck necks has stimulated the creation of several innovative dishes. Here is lovely one that I found on a Chinese recipe site. The name of the dish is ‘miniature babao calabash ducks’. The term babao ‘eight treasures’ has been introduced in an earlier post on babao porridge. As the picture shows, the ‘ducklings’ in this dish indeed look like miniature calabashes. They are in fact sections of duck necks, stuffed with glutinous rice. On the plate they strike you as small calabashes. Apparently, the Chinese cook does not want to run the risk that discriminating customers will criticise that they ‘don’t look like ducklings at all’. 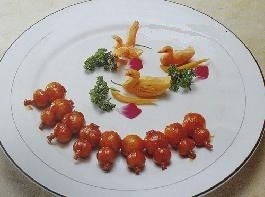 So he has carved a ducks out of vegetables; to make the dish more ‘ducky’. This is one of those Chinese paradoxes: the veggie ducks look more like ducks that the duck neck ducklings do. Even duck blood can be transformed into earnings. 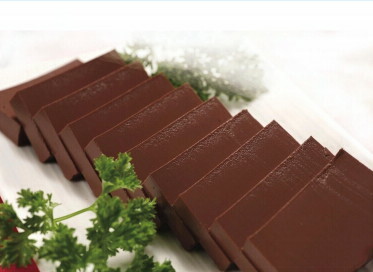 Huaying Cherry Valley (Xinyang, Henan) is investing in improving duck blood processing. The company has a special subsidiary to develop a range of products from duck blood, including blood powder and blood beancurd. The company processed more than 10 000 t of duck blood in 2014. 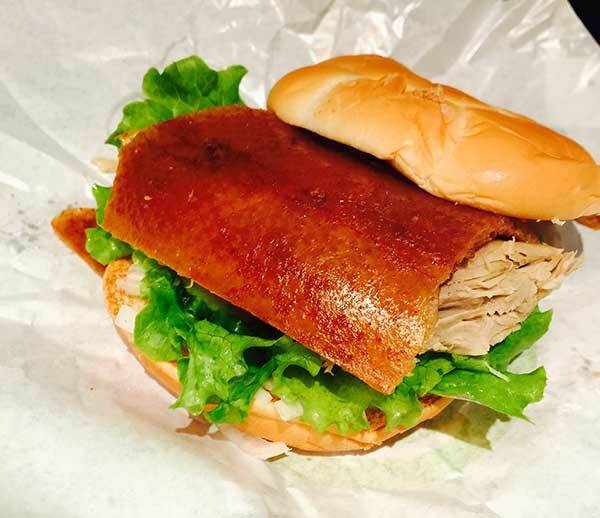 Dong Zhenxiang, Beijing’s legendary Peking Duck maestro, once joked that would serve up his specialty on a hamburger bun with a side of fries. Da Dong’s birds are so enshrined for special occasions that a downmarket sandwich, paper-wrapped for easy takeaway, seemed just plain odd. But no－he really pulled it off and we must admit that Dong is really on to something. His succulent signature duck comes with a tart bit of pickle in the salad layer that makes the plum sauce sing on the fresh bun. A newcomer in the world of Peking Duck is Dadong. 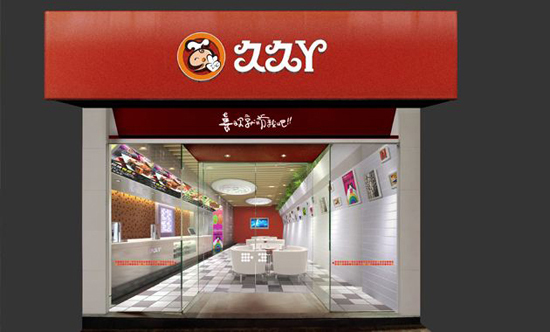 The name of this restaurant chain is derived from the surname of the chef/owner Dong Zhenxiang. He uses customised Justa ovens whose design is top-secret. They have indentations on the walls that bring the oven up to the right temperature. Dadong’s specialty is subuni (literally: ‘crispy, not greasy’) roast duck. However, the customers of Dadong are not only paying to enjoy the food, they also will experience Dadong’s yijing (‘artistic conception’) cuisine. Yijing cuisine features an exquisite Chinese cultural interpretation to culinary creations – each dish is incorporated with the elements of artworks such as Chinese poetry, literature, painting and bonsai grooming. It makes many of Dadong’s dishes resemble those of European Michelin-starred dishes. The first US subsidiary of Dadong has opened its doors in New York on Dec. 11, 2017. Dadong has had a tough time impressing the New York critics. According to Mr. Dong in an interview of January 2019, the subsidiary in New York is more of an artisan bistro, a new concept, but it is hardly making any profit. Dadong expanded its overseas presence further by teaming up with Dubai-based JA Resorts and Hotels in 2018, as the latter is eager to attract more Chinese tourists. The group’s Manafaru resort hosted over 5000 holiday goers from China in the past year, accounting for about 50% of total guests. Staying true to the core notion of this blog, ingredients, I need to point out how duck can also be even further processed to a food ingredient: duck powder. 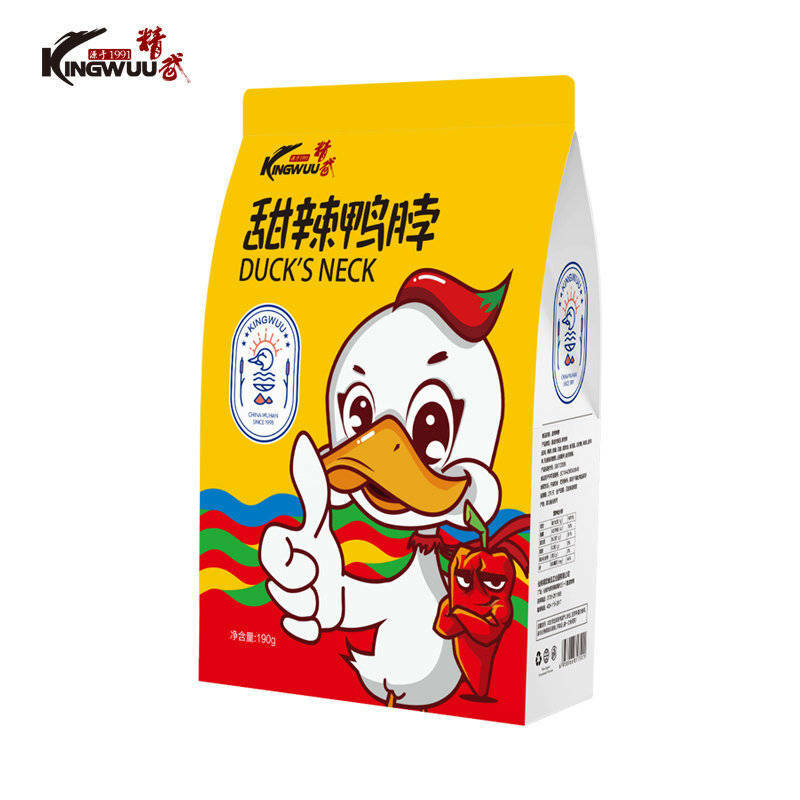 According to a major producer, Weixiangyuan (Guangdong), duck powder can be used to flavour a wide range of foods like soup, leisure food, snack food, biscuits, etc. 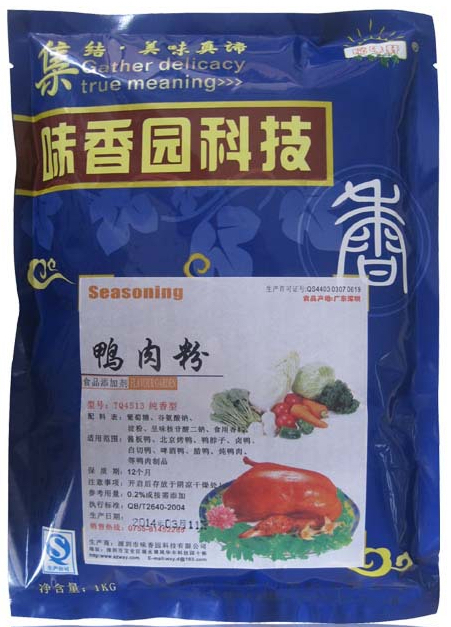 This entry was posted in Uncategorized and tagged aniseed, bay leaves, carrots, celery, celery seeds, Dadong, duck gizzard, duck heart, duck neck, Huangshanghuang, Huaying Cherry Valley, JIngwu, Jiujiuya, Juewei, Kingwuu, mirin, mushroom powder, onions, peking duck, Peony Duck, Quanjude, rosemary, Shang Palace, tarragon, Weixiangyuan, Zhouheiya by eurasiaconsult. Bookmark the permalink.